Learn how to use CLEAR CARE to clean your Scleral Keratoconus Contact Lenses in these 4 easy steps. Dr. Leonard takes the time with every patient to provide a comprehensive eye exam, combined with a tailor-fit solution to give them the best vision possible. One of the most important steps to follow for healthy contact lens wear is to wash and dry your hands before touching your contact lenses. Once your hands are washed and dry, you’re ready to start cleaning your contact lenses with CLEAR CARE® Solution. It all starts with the unique CLEAR CARE® Solution lens case. Each new purchase of CLEAR CARE® Solution comes with a special lens case that must be used in order for CLEAR CARE® Solution to work properly. With the special lens case, you’ll actually be able to see CLEAR CARE® Solution working—killing germs and removing protein, bacteria, dirt and buildup. Once you’re ready, remove and place each soft contact lens into the specially designed lens holders on the unique CLEAR CARE® Solution lens case. Do not put CLEAR CARE® Solution on your contact lenses and insert them directly into the eye or burning and stinging or redness will result. 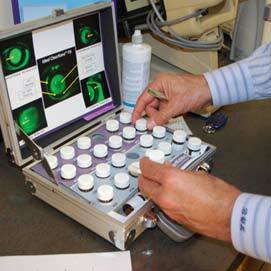 Remove and place each contact lens into the appropriately marked L/R domed lens holder. Rinse with CLEAR CARE® Solution for 5 seconds. Fill the lens case to fill line with CLEAR CARE® Solution and place the lens holder in the case. Remove your contact lenses one at a time and place them into the appropriately marked dome basket holder. Place each contact lens in the palm of your hand, apply 2 to 4 drops of CLEAR CARE® Solution and rub. While rubbing your lenses with CLEAR CARE®Solution, some users may experience a mild, temporary skin discoloration (bleaching) of the fingers or hands. Always wash and rinse your hands after rubbing your contact lenses with the contact lens solution. Return the contact lenses to the appropriate holder and close the baskets. Thoroughly rinse the lenses for 5 seconds through the basket with CLEAR CARE®Solution. Fill the lens case with CLEAR CARE® Solution and place the contact lens holder in the case. Tighten the cap and store contact lenses for at least six (6) hours. DO NOT SHAKE THE LENS CASE. Do not rinse the contact lenses. Place the contact lenses directly on the eye from the solution or place a few drops of a contact lens rewetting drop on the contact lens for extra cushioning. Always allow your contact lenses to soak for at least six hours or overnight in CLEAR CARE® Solution. This time is required to ensure complete neutralization of the hydrogen peroxide. To avoid burning or stinging, never put CLEAR CARE® Solution directly in or around your eyes. Do not remove lenses from the lens case before the six-hour soak time is complete. Also, make sure to put away your CLEAR CARE® Solution so that it is not accidentally mistaken as a multipurpose solution by a guest or a family member.